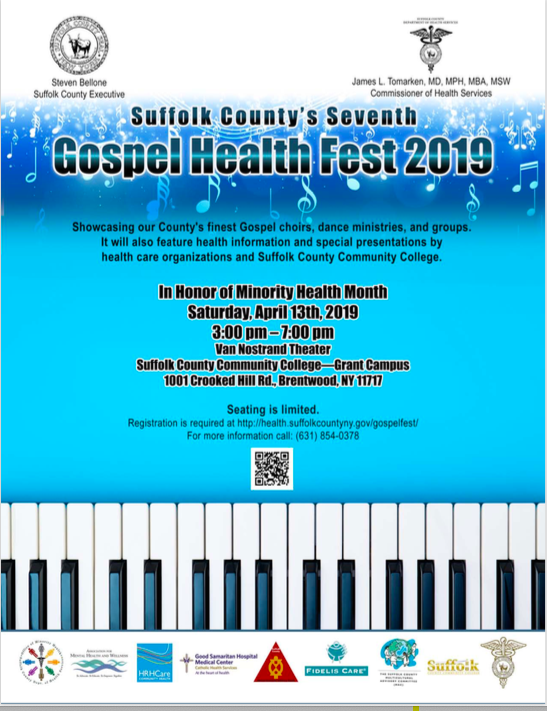 In honor of Minority Health Month the Suffolk County Community College – College Wide Office of Multicultural Affairs in collaboration with the Suffolk County Department of Health Services —Office of Minority Health are holding their 7th Annual Gospel Health Fest on Saturday, April 13, 2019 at Van Nostrand Theater on Suffolk County Community College—Grant Campus located at 1001 Crooked Hill Rd., Brentwood, NY 11717. Door open at 2:15pm, and the program is from 3pm -7pm . We will showcase local Gospel choirs, dance ministries and health segments with a health fair running concurrently. We plan to celebrate Community, Health, & Spirit through this event and would love for you to join us! For more information please call or email SC Minority Health @ (631)853-5078 / OMH@suffolkcountyny.gov .This event is FREE of charge and refreshments will be served, so feel free to share. Sign up, bring your family & share with a friend!